January 8, 2012 (by Eric L. Palmer) - The U.S. Navy F-35 Joint Strike Fighter (JSF) known as the F-35C is at serious risk of never being able to land aboard an aircraft carrier. This also poses a risk to the U.K. aircraft carrier program which is supposed to use the F-35C at the end of the decade. Back in 2007, a Lockheed Martin year in review video stated that the F-35C carrier variant (CV) JSF had passed critical design review (CDR). The video and similar public statements said, "2007 saw the completion of the critical design review for the F-35C. The completion of CDR is a sign that each F-35 variant is mature and ready for production." Yet, a November 2011 U.S. Department of Defense (DOD) quick-look report relating to engineering challenges arising from what is being called “concurrency issues” revealed that all eight run-in/rolling tests undertaken at NAS Lakehurst in August 2011 to see if the F-35C CV JSF could catch a wire with the tail hook have failed. 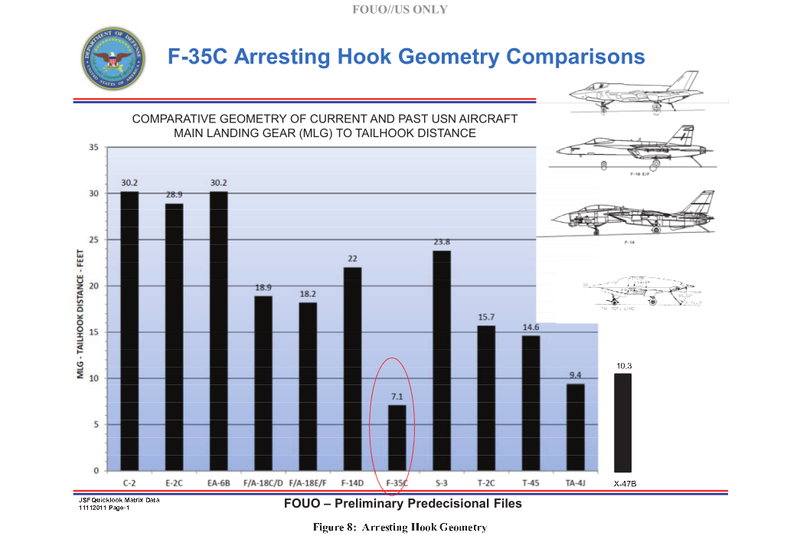 The report also mentions that the tail hook on the F-35C CV JSF is attached improperly to the aircraft. The distance from the hook to the main landing gear is so short that it is unlikely the aircraft will catch the landing wires on a ship's deck. This graphic from the review explains part of the problem. It illustrates the distance between the main landing gear and the tail hook of previous warplanes qualified to operate from aircraft carriers and compares these distances with that found on the F-35C CV JSF. In this regard, the report refers to the F-35C CV JSF as “an outlier”. An industry expert who is a graduate Flight Test Engineer (FTE) of the U.S. Naval Test Pilot School (USNTPS), Peter Goon, stated that, "Given the limited amount of suitable structure at the back end of the JSF variants, due primarily to the commonality that was being sought between the three variant designs and the fact that the STOVL F-35B JSF is the baseline design, there was always going to be high risk associated with meeting the carrier suitability requirements." He also points to well known and well understood military specifications that address tail hook design requirements, such as MIL-A-81717C and MIL-D-8708C. When asked how such things could have been missed, Peter suggested they likely weren’t, at least by the engineers, but their concerns would have just as likely been ignored. He said this should come as no surprise, given the level of stove-piping that had been applied to the F-35 program's engineer community and the dominance of “form over substance” and “a total indifference to what is real” being hallmarks of the program – “Affordability is the cornerstone of the JSF Program” being but one example. It is highly probable that this design fault could be the last straw for the F-35C. The program will attempt some more rolling tests with a different hook design, but this does not address the problem of the poor location of the tail hook on the airframe. Other F-35 program problems identified in the QLR Report included the helmet visual cueing which is seriously affected by design issues and airframe buffet in the heart of the combat envelope. Also, all F-35 variants suffer from paper-thin weight margins, unsafe fuel dumping, flight restrictions on diving, speed and proximity to lightning hazards to name a few. And, it can only be flown during the daytime. An August 2011 DOD F-35 program briefing revealed that the engineers will have to be reorganized because they were not getting access to all the information/data they needed for design nor, it would appear, were organised and structured in an environment that was being properly managed and transparent. This reorganisation should complete in 2012. The program's pilot training program was supposed to start at Eglin Air Force Base, Florida in 2011 after previous delays. With the design issues mentioned above, pilot training is effectively grounded due to safety concerns. There is no known date when pilot training can start. This along with the aircrafts engineering defects strongly suggest that it will be a long time until military services see any F-35 variant in a go-to-war configuration.